Transatlantic Race – While the oceanic speedsters of the Transatlantic Race 2015 have long since docked after making the 2,800 mile crossing from Newport to The Lizard in just over a week, a thought needs to be spared for the nine boats still at sea. Six of these have been battling the North Atlantic for two and a half weeks, while the back marker of these, Paul Anstey and Craig Rastello’s Florida-based C&C 41, Dizzy, this morning has broken the ‘500 miles to go’ barrier with an ETA at The Lizard of Saturday afternoon. They eeked out a new top speed of 22 knots for Zephyr, but apart from running over a kite at one point, there was surprisingly few issues otherwise. Sharples attributed this to the preparation work the crew put in before leaving. Zephyr is one of two Royal Yacht Squadron boats completing in the Transatlantic Race 2015, alongside Sir Robin Knox-Johnston’s Open 60 Grey Power. She currently leads the Cruising Class in which she is first to finish. At the time of writing, the latest boat to cross the finish line off the Lizard point, is Ian Matthews’ Jinja, a French designed and built Pogo 12.5, which her owner describes as being a cruising version of a Class 40, without water ballast and with a shorter rig. Rather than head to Cowes in light winds, Matthews and his crew, mostly a family affair including two sons and a son-in-law, opted to head for their homeport of St. Mawes, opposite Falmouth, close to The Lizard. Built by Structures, which is best known for its Class 40s and Class 6.50m yachts that compete in the Mini Transat, the Pogo 12.5 has a strong ocean racing heritage and it was perhaps for this reason that it saw the Jinja crew successfully cross the North Atlantic with minimal damage outside a small rip in their mainsail, which they managed to patch. This Transatlantic Race 2015 completes an Atlantic circuit that Jinja started with the Atlantic Rally for Cruisers from the Canaries to the Caribbean in 2013. “But this was a bit tougher than the ARC,” observed Matthews. The only Spanish boat in the race, Jose Diego-Arozamena’s Farr 72 Maximizer finished the race yesterday morning at 02:42:45 UTC (13 Jul 22:42:45) and then headed for Plymouth. She is currently lying in second place in IRC Class Three behind Larry Huntington’s Snow Lion. 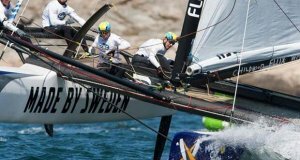 Among Maximizer’s crew was short-handed non-stop round-the-world sailor Pachi Rivero. “The Transatlantic has been a spectacular race,” Rivero wrote. “We have fought against much newer vessels in our class, and that has forced us to be very precise with our sailing and tactics. 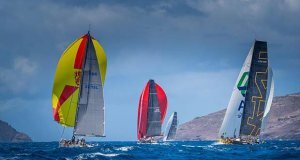 I am very proud to represent the only Spanish yacht to complete this race and to add more points to the Atlantic Offshore Racing Series.” The AORS comprises four events including the Transatlantic Race 2015, preceded by this year’s RORC Caribbean 600, and followed by the Rolex Fastnet and Middle Sea Races. Mike Dreese and Rob Windsor were the final Class 40 to finish. Their Akilaria RC3, Toothface2, passed The Lizard finish line yesterday morning at 04:17 UTC (00:17 EDT). Unlike the two European Class 40s, winners Stella Nova and runner-up Visit Brussels, the American Class 40 entries were all sailed doublehanded with Mike Hennessy and Kyle Hubley on Dragon winning their private race with Toothface2, after the fifth boat in the class, Amhas, retired into the Azores. While the Transatlantic Race 2015 was Windsor’s 10th Atlantic crossing, it was the first for Toothface2’s owner Mike Dreese, for whom it was an ocean racing baptism of fire. On two occasions they saw winds of more than 50 knots and, according to Windsor, they suffered in the latter stages of the race lacking a much needed A5 fractional spinnaker which they’d blown up early on in the race. They were also slowed for a period as they were sailing with something wrapped around their keel which required them to back down to remove it. Almost all the boats competing suffered sail damage of varying degrees but on Toothface2 they tore the top of the mainsail. This required the sail to be dropped while Windsor hand stitched it, stuck on a sail cloth patch and then had to wait patiently for the glue to dry. “We sailed for eight hours with just the staysail up,” he said.